In February 2013, Luo Yuanshui found a strange looking stone in the mountains of Shangyou, Southeast China. 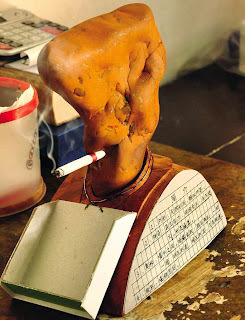 He claims that the head-shaped rock can inhale a cigarette in five minutes. When the first time he found it, his instinct was to place a cigarette in what looked like a mouth. Naturally, cigarettes with variations for length and brand, take around six minutes to burn down if left unsmoked. But somehow his nicotine-loving rock puffs them even faster, said Mr. Luo. Mr Luo, from Fujian province, shows the 2.2kg (4.9lb) marvel to visitors, with an ashtray close by so it can indulge its vice. A lot of visitors -including a couple who appeared transfixed by the geological marvel- interested with its haggard appearance, because it certainly looks like a hardened smoker and until now mystery still surrounds the nicotine-addicted rock.